Keeping things secret is the best way to keep them safe,” said Munich customs official Siegfried Klöble in 2013, one and a half year after the discovery of the Gurlitt trove. When the public learnt about the 1,500 works of art found in the homes of Cornelius Gurlitt, all kinds of speculations were raised. Initial estimates placed their total value at more than $1 billion. Gurlitt died in 2014, leaving behind a tangle of questions about the vast art collection amassed by his father under the Nazis. In the past few years, only few answers have been found. The Gurlitt task force, a group of German researchers, has been trying to clarify the origins of what has been called the biggest artistic find of the postwar era. The task force has faced much criticism over the slow pace of the investigation. So far, the experts have been able to identify the former owners of only six paintings. The international sensation has been replaced by both discontent and more serious research on looted art. of the most famous French victims of the Nazi regime, the high-ranking Jewish politician and anti-Nazi Georges Mandel. The Gurlitt case draws attention to the role of the art trade within the criminal Nazi regime and to the fact that Hildebrand Gurlitt benefitted enormously from the gradual disenfranchisement, dispossession and despoliation of Jews in Europe. “As an art historian, Hildebrand Gurlitt championed the art of the avant-garde, but as an art dealer, he tendered his services to the Nazi regime,” explain the curators. “The provenances of the works shown here clearly demonstrate that he had no qualms about their often problematic origin.” The exhibition depicts Hildebrand Gurlitt as a man who was prepared to exploit every aspect of Nazi policy to personally enrich himself. and respect,” the organizers emphasize. 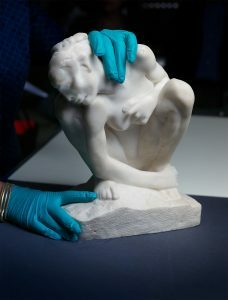 To facilitate the investigation of the provenance of the individual works and safeguard the transparency of the process, the suspect works were registered on the Lost Art Database. In most cases, however, the provenance has not yet been verified. 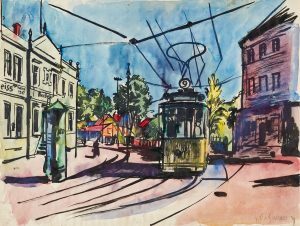 This applies for example to Straßenbahn (Streetcar) by Bernhard Kretzschmar (1889–1972), a founding member of the Neue Dresdner Sezession in 1932. His art was regarded as ‘degenerate’ during National Socialism. While the exhibition doesn’t unravel the mysteries of the reclusive Cornelius Gurlitt and his enigmatic father Hildebrandt, it sheds light on modernist artists whose achievements have as yet not been completely explored and investigated. Still, Gurlitt: Status Report remains unfinished business.